I don't know about you but I am super excited that it is Friday! I am even more excited that its Easter weekend and my whole family is home! My little sissy made her grand entrance into Minnesota about 9 last night, our night was filled with lots of laughs! It is always good to have my whole family together! Especially for a holiday weekend! I am really excited about Easter this year. This is the first time in two years that I will be home celebrating Easter with my family! You better believe there will be lots of food, laughs, for sure an Easter Egg hunt (you are never to old for Easter egg hunts) and of course dying Easter Eggs! Speaking of Easter I really want to make these! DIY Reese's Peanut Butter Eggs! Heck yes! I could seriously eat an entire basket of those things! I mean come on its peanut butter and chocolate! There is nothing better in my eyes! Alright lets check out those recipes I introduced to you on Monday! I did promise you I would give my two cents about them! Lets begin with the huge chopped salad! You know I am a huge fan of huge salads, I love them even more when the salad includes multiple types of veggies. I will say this, the creamy vinaigrette was a little interesting. Very tangy, almost to tangy for me! I think next time I would tone down the mustard just a bit! The dressing had the texture of a thinner hummus, great for cracker or pita bread dipping! I think I will keep this salad for inspiration but come up with my own dressing! Next up a lemony orzo salad! This dish was light, and will be great for summer. The asparagus and tomatoes combined well with the bright lemon infused dressing. I added a bit of rosemary to the dressing as well! We served our salad along with some browned tofu for a little protein, nice and light! The one downside to this salad is the pasta absorbs a lot of the dressing! After a few days in the fridge it can become a bit dry! Best eaten the day it is made or a day or two after! Tonight per the request of my sister we are making the Southwester Pita Pile Up, and the brussel sprouts are being featured at Easter dinner! Hope they both turn out well! Well there you have it! Happy Friday everyone, I hope you have a wonderful weekend! And Happy Easter, enjoy the time with family and friends! the lemon orzo pasta looks so good. and even the easter candy.. yum! happy easter!!!!!!! 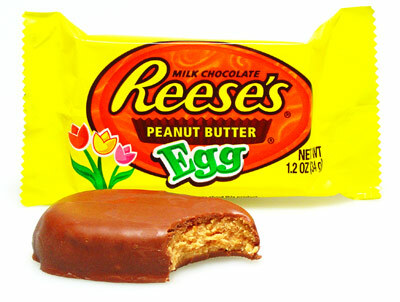 Nothing makes me happier than a Reese's egg!